TruePublica Editor: This is a really interesting article by a political scientist from the University of Colorado. It highlights the cost of military expenditure in the US and breaks down that cost as if presented to each citizen as a tax bill. One wonders just how much people would want to pay for the bombing of nations on the other side of the world and 800 global military bases if a military tax bill was presented each year! I wondered how this might compare in Britain? In Britain, the overall military defence budget is around 2% of GDP or £45 billion. Add in the unfunded military pension scheme costing £4.5 billion (overall unfunded pension scheme approx. £130bn) per year that supports nearly half a million retirees. 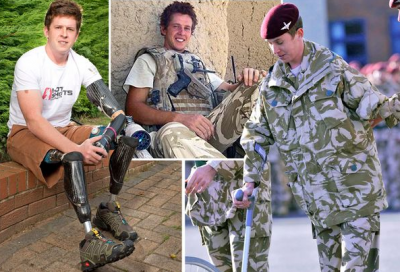 The lifetime healthcare costs of each amputee as a result of the Afghanistan conflict alone is costing £1.06million per person and there’s a few hundred of them to consider. In a breakdown of injuries sustained by military branch or service between 2006 and 2014, the British Army was hardest hit with 3,544 wounds, followed by the Royal Marines’ 383 injuries. The RAF sustained 190 and the Royal Navy sustained 40. A 2014 statistical analysis based on Freedom of Information (FoI) requests carried out by the military charity Help for Heroes claimed that up to 59,000 Afghanistan and Second Iraq War veterans could be suffering the effects of mental injury. The true medical costs, plus housing and other benefits as a result of being unable to work are unknown. In addition, the cost of the activities of MI6 and GCHQ in terms of military ‘support’ is also not known. In fact, the true overall hidden costs just keep escalating. As a guesstimate, it would be more than reasonable to state that 3% of the national GDP goes towards supporting the military one way or another – or £1,634 per working age adult (aged 16-65). The ONS states that of this group of taxpayers, 8.7 million are not in work. Equally, the amount of total taxpayers, including taxpaying pensioners adds up to 29.5 million in total, or £2,271 per taxpayer. Median individual earnings in the UK sits at £21,000 per year. Of course taxation into the treasury comes from all sorts of sources but like the article below it highlights the cost of military expenditure on a more personal basis. Mises Institute: Government employees and their apologists like to lecture Americans about how “freedom isn’t free.” And indeed it isn’t. In recent years, the US military establishment has cost the American taxpayer around $700 billion per year. Thanks to the hard work of the American taxpayer, the US military — and other “defense” agencies such as the Department of Homeland Security — the US government is the most well-funded in the world. In spite of numerous ongoing interventions worldwide, casualties in the US military are low thanks to highly-advanced technology funded by — you guessed it — the American taxpayer. Now, for the sake of argument in this article, we’ll just assume that the full $700 billion per year has something to do with actual defense. This is a highly debatable notion, of course. As more astute observers have noted in the past decade, it is not at all clear that the trillions of dollars spent in Iraq and Afghanistan have done anything at all to augment security in the United States. We’ll also conveniently ignore the catastrophic failures of our extremely-well-heeled American security states, such as those on September 11, 2001. All of that aside, we still find that American taxpayers are toiling mightily for their alleged freedom. There is no doubt that $700 billion is a lot of taxpayer money. But just how does this total break down on a per-person basis? Well, if we divide $700 billion by the 320 million people in the United States, the per-person total comes out to $2,187 dollars. That’s for each man, woman, and child. Now, of course, these costs are not spread out evenly among all taxpayers. The relatively high-income households pay more than low-income people when it comes to federal taxes. So, military personnel should especially be thanking higher-income taxpayers for their service. But, if American were taxed evenly for military costs, that would mean that a family of four would be paying $9,200 per year for “defense.” After all, children need military defense, too, and somebody has to pay for it. Why not their parents? A large family, say one with four children, would be paying $13,800. Given that the median household income in the United States is $52,000, this is no small amount. If we’re so concerned about Americans knowing that “freedom isn’t free” it might be best to move toward a fee-for-service model. In that case, Americans would be acutely aware of how much they’re shelling out for the military. On the other hand, were households faced with a $9,000 “defense” bill every year, they might be less inclined to thank someone else for spending all that money. None of this includes the many non-monetary ways that Americans are taxed to support the military establishment and its employees. We could also include as “taxation” the destruction of privacy in the name of “fighting terrorism.” Thanks to the USA PATRIOT Act, among other pieces of legislation, Americans are subject to many violations of their Fourth Amendment rights in the name of “protecting” freedom. The many abuses and excesses of American airport security under the TSA are a form of taxation as well. Every time an American taxpayer is forced to miss a flight, has property confiscated, or is generally treated like garbage by the TSA, this is an additional cost imposed. Border controls impose many costs as well. Americans are now routinely subjected to extensive searches and seizures at the border, as border agents rifle through personal effects, seize phones, and subject taxpayers to hours of questioning upon re-entry. Moreover, in the name of security, the US can close off Americans from access to foreign resources. This occurs when the US imposes trade embargoes or other trade restrictions in the name of security. When an American wishes to buy goods from a person in a “restricted” country, or wishes to sell goods to a person in the same country, that cuts the American off from using her or her private property in a peaceful manner. A similar problem occurs when the US denies entry to persons who have been invited into the US by American taxpayers. When a taxpayer invites a friend or colleague into the US — but then that friend or colleague is denied entry — this imposes yet another cost on American taxpayers. None of these costs show up in tax bills, of course. But they exist. All the while, we’re being told that these restrictions, embargoes, searches, domestic spy operations, and bans are all necessary to protect freedom and security. That may or may not be true. But even if they are true in some cases, let’s stop pretending that they’re not imposing a significant cost on those who are supposedly receiving a gift from government agents who are “serving” the American public. This isn’t to say that defense of property — including human persons — is something that need not be done. Of course security is an essential service in any society. This is true even when monopolistic government agencies co-opt security services. But, this doesn’t make security services special. Food production, energy production, and home construction are all essential services. Nevertheless, we’re not told to run up to farmers and oil workers and roofers and thank them for their “service.” But, we’d notice a lack of food, housing, and energy immediately, were those workers to disappear. Moreover, try running a military without food and gasoline. You’ll quickly find it’s rather difficult. Ryan McMaken (@ryanmcmaken) is the editor of Mises Wire and The Austrian. Ryan has degrees in economics and political science from the University of Colorado, and was the economist for the Colorado Division of Housing from 2009 to 2014. He is the author of Commie Cowboys: The Bourgeoisie and the Nation-State in the Western Genre. 2. Active duty military personnel make up only 0.4 percent of the US population.